Just kidding, but wouldn't that be a classic title for a horrible and sarcastic review of a restaurant near the Capitol South metro station whose name is Tortilla Coast? (He grins widely to himself.) Luckily for Tortilla Coast, I quite enjoyed their place. It was a convenient one-metro-stop ride from Eastern Market, and the service was fast enough that Julia and I were able to enjoy a post-market lunch with friends Kate and Francisco without worry that our wares would spoil pre-fridge. This place came highly recommended from none other than our market/lunch buddies themselves. This is one of their favorite places in DC for Mexican. However, Kate had me at hello, well actually barbecued chicken. As soon as I heard that they made quesadillas (and burritos and fajitas) with barbecued chicken, I was hooked to the idea of trying this place. Even if the rest of the menu was fairly mundane Mexican (which it was), I knew there would be at least a few items that were creative and intriguing and definitely order-worthy. I just had to try that barbecued chicken. The place had a nice game-day/group gathering feel, which was good since it allowed me to catch the closest and most interesting part of the OSU trouncing of my Michigan boys without it being too loud to enjoy a conversation with my table. They had quite a few different beers and drinks and good chips and salsa too. But I might as well fast forward to the inevitable – my order of the barbecued chicken quesadilla. What arrived looked like any other good quesadilla – crispy, flaky tortilla; cut into triangles; a little ooze; a little oil evidence (this one perhaps a little above average on the oil). But on further examination, there was the beautiful sight of the contents – cheese, chicken, barbecue sauce, red peppers. Even despite the oil, this was a treat to remember. It was that combination of smoky, tangy, salty, savory, spicy and just a slight bit of sweet that leaves you feeling wholly satisfied. The best part was probably the smokiness of the barbecue sauce – it had a lot of depth and wasn’t too sweet like some BBQ sauces can be. 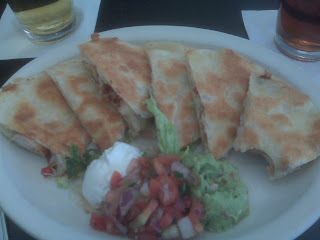 It just sort of melted in my mouth, so much more so than a traditional quesadilla, which I will rarely if ever order. This one was killer, no doubt about it. And that's probably the reason why both Tortilla Coast veterans at my table went straight for the barbecued chicken selections as well. There is nothing really left to say about Tortilla Coast. A pretty good place with a little niche that is probably just unique enough and darn delicious enough to get me remembering it and returning. Probably even good enough for me to rename this review, Tortilla Boast. Nah. Just not as funny. Read my reviews in more detail and other restaurant reviews at Menuism.